CARGO cosmetics has just announced the re-launch of their website, www.cargocosmetics.com! You can now order online direct from them, and as a thank you gift to their customers, they're offering 20% off your first order when you register for their newsletter. Along with the re-launch of their website comes their spring 2011 collection, Voyages. It's a set of travel-friendly, multi-tasking beauty essentials, and I had the opportunity to review a couple of the items. The centerpiece of the spring collection is the Safari set. 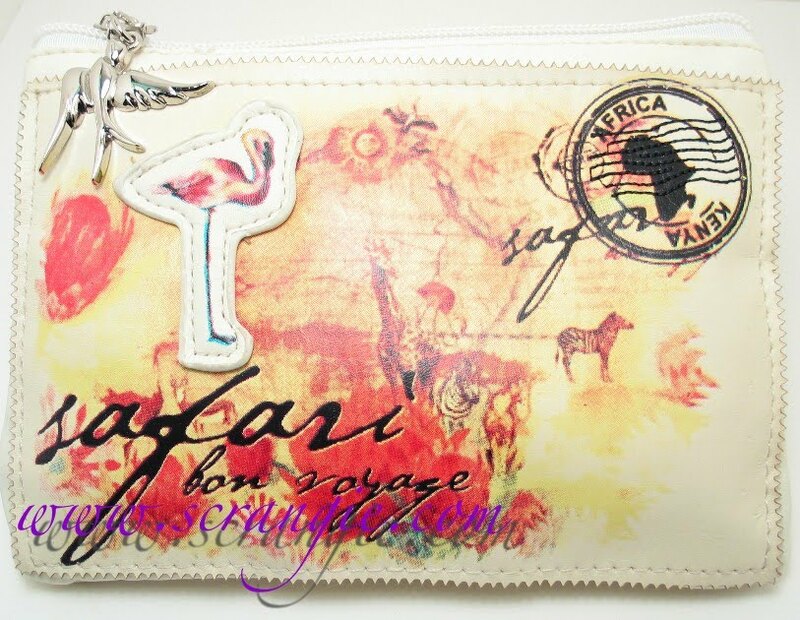 It's an adorable makeup bag filled with travel ready shades inspired by the colors of the African savanna. 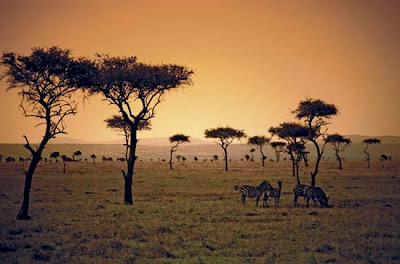 It includes three full sized items and two minis, and it comes in a really nice safari-themed makeup bag. 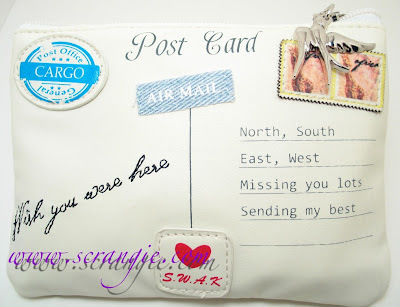 One side has this adorable postcard theme, with appliques and stitching. 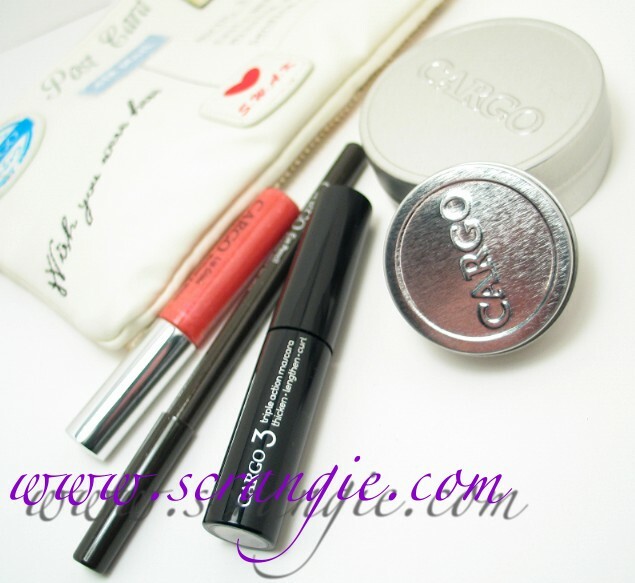 It's a really nice quality; it's not a throwaway bag like a lot of travel sets have. The material feels like a soft, buttery leather and it seems sturdy and well constructed. 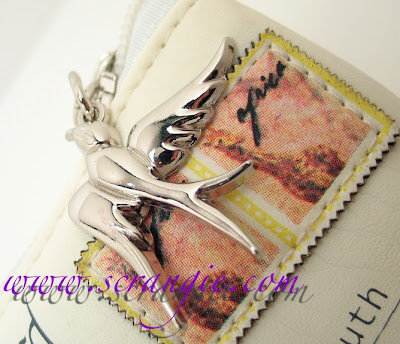 It's a swallow charm. I really like this little extra feature. Swallows have symbolic meaning for travellers, especially sailors. There are multiple meanings behind the swallow symbol. Swallows are known for their faithful return to San Juan Capistrano every year, flying over 6,000 miles to make it back. So, for some, swallows are a symbol of faithfulness and returning home after travel. For sailors, a swallow tattoo was somewhat of a merit badge- traditionally, each swallow tattoo they had represented 5,000 nautical miles that they had travelled. Swallows are also a symbol of returning home safely, as it's said that they appear when ships are nearing land. Whatever the swallow means to you, it's a nice touch that's especially symbolic in a collection called Voyages. The other side of the bag has a safari theme. 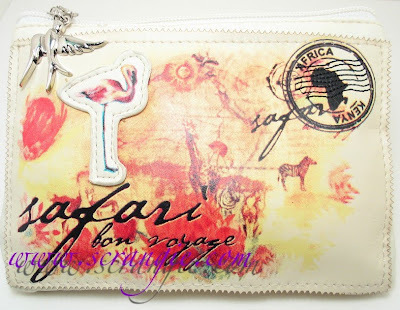 The safari image is printed and the flamingo is an applique. Enough about the bag. You know how much I love packaging, so I could go on and on about it... But there's makeup inside! A full sized eyeshadow duo in a new shade: the left half is a sparkling metallic gold and the right half is a dusty olive-khaki shimmer. A full sized Beach Blush in Coral Beach. 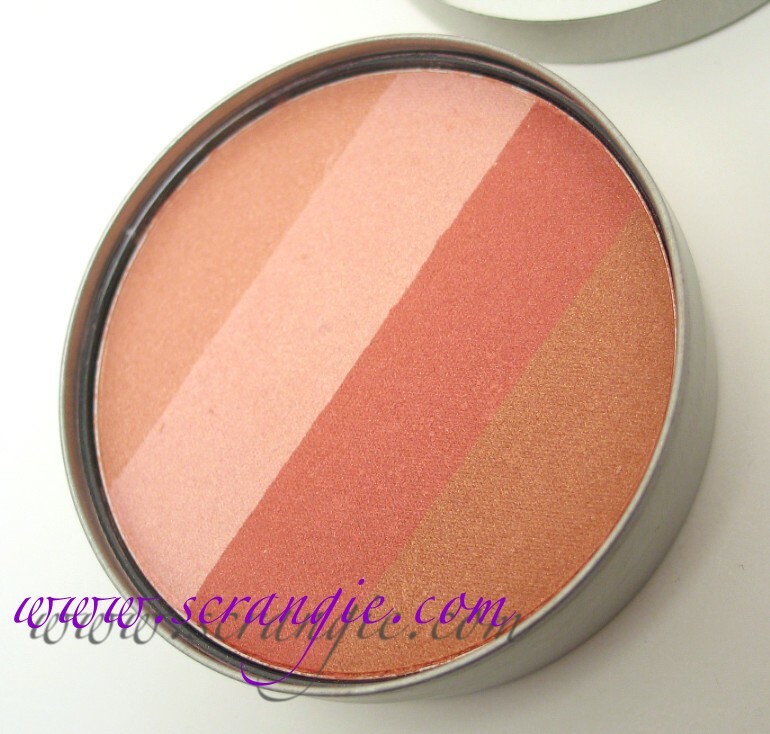 It's a blush-bronzer fusion; it has stripes that can be used separately or blended together. 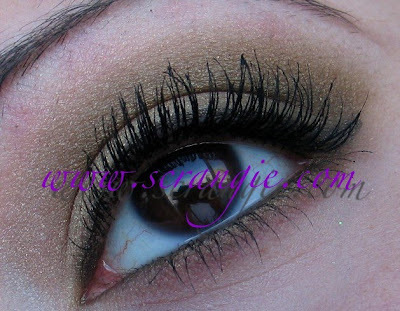 It has a light golden bronze, a medium coral, a light peachy-pink shimmer and a medium peach shimmer. 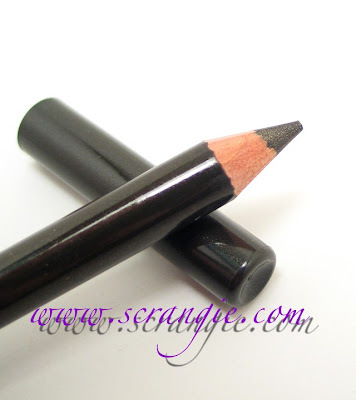 A full sized eyeliner pencil in Khaki. Khaki is a deep brown with a slight green undertone and lots of delicate gold sparkle. 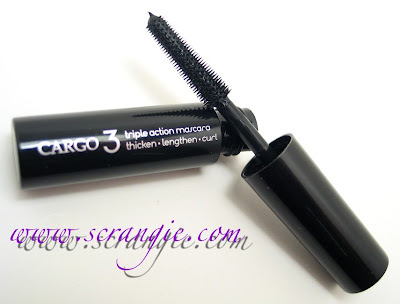 A mini Triple Action Mascara. It's a curling mascara that also lengthens and thickens the lashes. 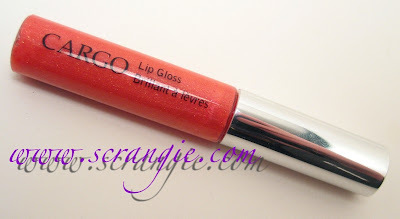 ...And a mini lip gloss in Serengeti, which is a sheer pinkish peach coral with tiny, tiny gold and copper microglitter. Gold half of shadow duo, green half of shadow duo, Khaki liner, Coral Beach blush and Serengeti gloss. If you enlarge the picture, you can see the pretty sparkly microglitter in the gloss and the liner. 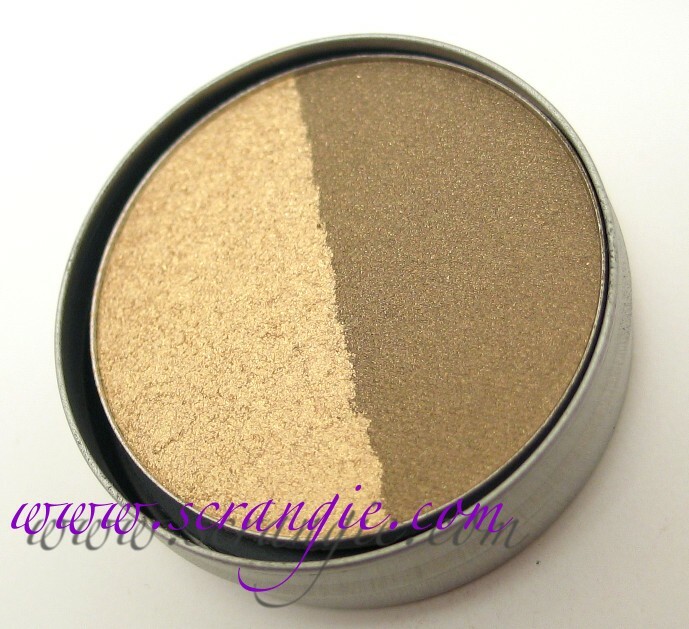 The eyeshadow duo has a very silky, velvety texture. The pigmentation is very good, but it's also buildable. You can do a more sheer wash if you apply lightly, but you can also build up both colors to make them sparkle more. I find that the gold half is easiest to apply with the fingers; it has a light, flaky texture that looks more glittery when applied with a brush, but more of a smooth metallic when applied with the fingers. It can look slightly flaky when applied with a brush, but that is easily remedied (if you don't want the sparkly look) by quickly smoothing your finger over it after applying. The packaging on the shadow duo is also rather cute. It comes in a tiny silver tin, like a smaller version of the blush. The eyeshadow feels hefty, it really feels like you're getting a good amount of product and the pan seems really deep. The only downside to the shadow duo is that it doesn't seem to have a name. The blush is excellent. The shade is extremely flattering on my skin tone, but I can see it working well on both fair and dark, warm and cool skin tones. At first I was afraid it would be frosty, but it really isn't. The shimmer is very minimal and can be buffed/blended away if you want to tone it down even more. When I used it, I blended all the shades together and it became a lovely warm coral. You can also pick out the individual shades with your brush; bronze for bronzer, peach or coral for blush and light pink for a highlight. The shades are all pigmented enough to double as eyeshadow, too. The mascara was okay, but not my favorite. It looked really nice, but I just prefer more volume. It applies really smoothly and doesn't clump. It has one of those spiky plastic brushes so it gives tons of definition and acts as its own lash comb. It gives good length, great definition and decent volume. It's supposed to be a curling mascara, but I always curl my lashes anyway so I didn't notice the curling effect, if any. It didn't flake on me when I wore it and it was easy to remove. The gloss is nice, too. It has a very silky, non-sticky texture. The shade is my favorite part of the gloss; it's a sheer coral that has an iridescent sheen and some super tiny gold and copper glitter to give it sparkle. The glitter doesn't feel gritty; it's too tiny to feel. The effect is subtle but still interesting. I might like to buy a full size of this color... The only flaws with the gloss are that it's really small (the tube doesn't seem filled completely to the top) and it's unscented. It doesn't have any detectable scent or flavor. I know a lot of people who prefer an unscented gloss, but that's boring to me! 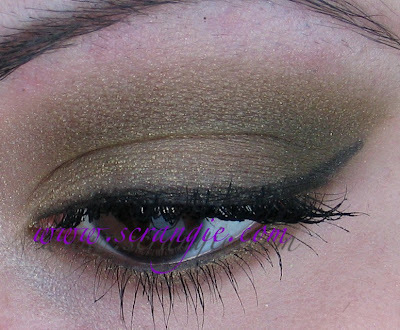 If you enlarge the pictures, you can see the gold sparkle in the eyeliner. 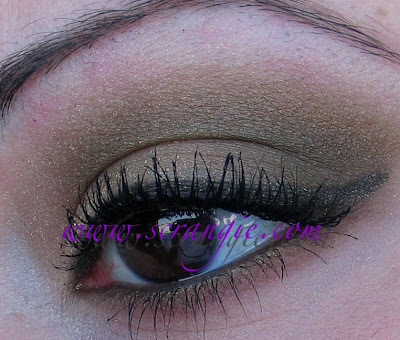 This is a more subtle look, but I think it looks really fantastic against my eye color. Three coats of the Triple Action Mascara. It did a really great job of separating and defining my lashes, so if you like a more defining, lengthening mascara, this might be a good mascara for you. I personally prefer a bigger, fatter, faker lash look from my mascara. Overall, I think this is an excellent set. The quality of all the items is great and isn't lacking in any area. The packaging is attractive and well-made. But, what I think I like most about the Safari set is that it has everything you need. Eyeshadow, eyeliner, curling mascara, blush and gloss. The only thing I could think to add to it would be an eye primer and a tinted moisturizer or foundation, but otherwise this is perfect. After testing this out, if I had the chance, I would totally buy this again. Especially because it's a really good deal; only $34! Three full sized products for $34. The Beach Blush alone costs $28 and an eyeshadow single is $16, so yeah, super good deal. And, if you get it with the 20% off code it's around $27 so it's like you're getting a discount on the blush and the rest of the stuff is free. This is only my second experience with Cargo eyeshadows and I have to say I'm impressed. 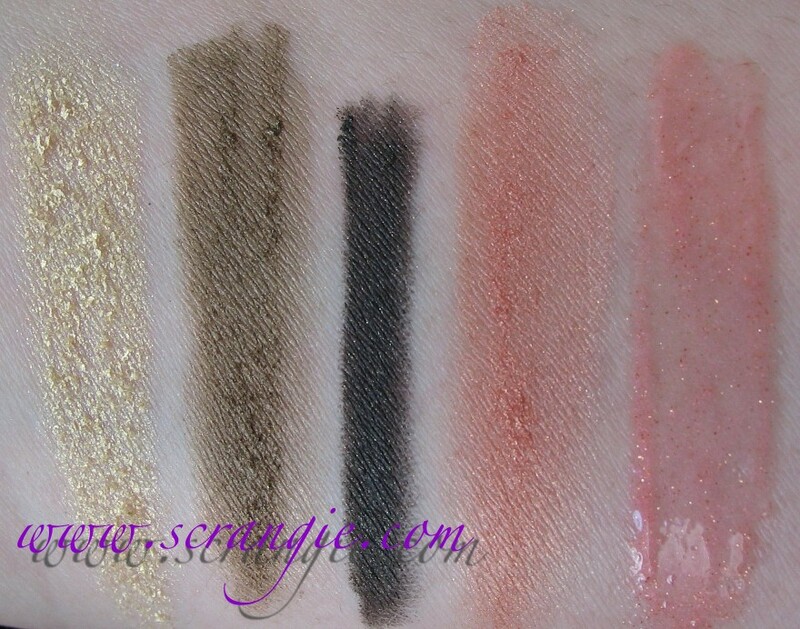 My first experience was with the Lumieres du Monde palette and I liked that, but I love this. Now I feel like I've been missing out by not paying more attention to CARGO. I really want to play with more of their shadows and Beach blushes now. This is available now on CargoCosmetics.com, Ulta, Sephora at JC Penney and Beauty 360. Oh my gosh, I really really love this. I think the only thing I wouldn't use is the mascara. Love the shadow duo. Is the bag big enough to throw in a primer and tinted moisturizer? Or is it a tight fit with the items that come with it? Karen, the bag is definitely big enough for a few more items. With everything included, there's still room for an average sized foundation bottle and a tube of Primer Potion or something similar sized. OMG, this duo is breathtaking on your gorgeous eyes! 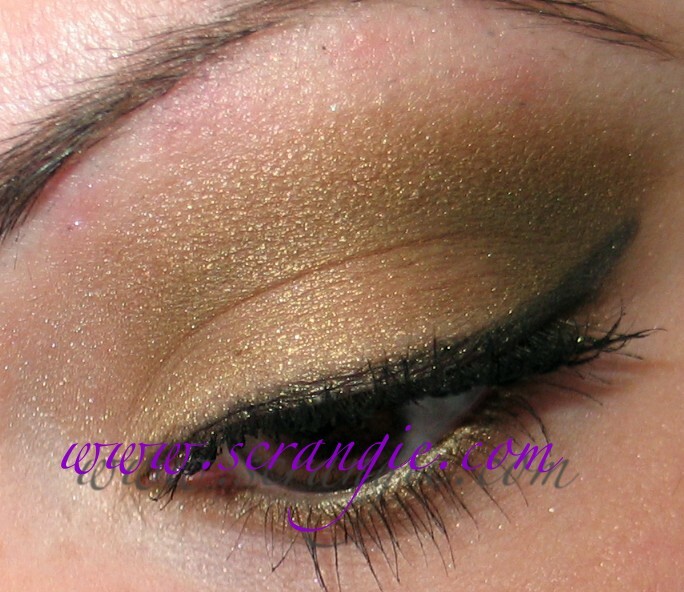 Love the eyeshadows on you! Sherri, sorry! My lip pictures never turn out =/ If I could ever get a good one, I'd do it, but so far I haven't been able to! Is it bad that I love the bag more than the makeup? LOL! I think I'm going to get this. Good Lord, I haven't purchased non-nail polish make up in forever! Scrangie, what a lovely post! You're the best! Love this set. The makeup case is wonderful. Thanks for all the background history of the swallow. Interesting. Very pretty makeup look. Thanks for the review, I have one Cargo blush which has lasted me YEARS and I still love it. This one looks really pretty too - I'll have to see if Cargo are shipping internationally! But what I'm really interested in is which eyelash curler you use - your lashes are always so beautifully curled! Please let me know! I <3 that blush. I got it in a small kit from a giveaway and plan to purchase the full size. 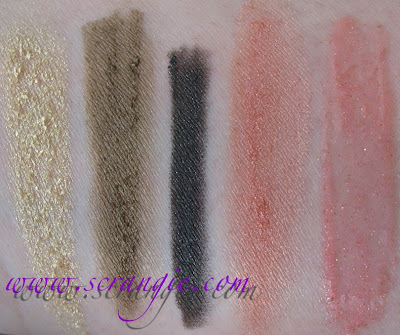 It's great to use as an eyeshadow and blush for a quick all over color look. I use the lighter two shades on the brow and the darker two on the lid, then all 4 together on the cheeks.